It is amazing when you see a webmaster using a blogspot blog stealing an AdSense Java Script Code and using it on their website. They will usually keep your unique publisher ID while showing ads from your account. While their action may be unintentional in terms of them not caring which ID that they use, the net effect is that you are now involved in their illegal action. Whatever their reason for doing so, once they are caught and banned for using illegal and plagiarized materials, chances are that Google will also ban your Adsense account as well because it violates the terms of service and the program polices even though you may not have been aware that this happened to you. It doesn't really matter to Google because they see your unique publisher ID and assume that it is you posting the illegal materials. In addition, there are websites that also use the iFrame HTML program that will embed to the post and pages of your website as well. This means that you are now violating the Terms of Services as well as the Program Policies because they are showing the AdSense ads inside an iFrame which is forbidden. Again, because it is your website, Google will assume that it is you unless you can take appropriate action. While this may seem unfair, it must be noted that Google has recognized the practices of others in using the websites and unique publisher ID, so they have developed a new feature called "Access and Authorization" that you can find within the dashboard of AdSense. It is here that you can only allow certain sites to show ads for your account and not have to worry about getting punished for something that you did not do. - Your Domains: Any domains and sub-domains that you own where you want to monetize them with AdSense. - Country Specific TLDs: Basically, any country-specific TLDs of Google will need to be included as well, for example a .blogspot.com blog (see the screenshot below). To find a complete list of all Google domains, click HERE. - Translate Site: If some of your customers are using translation sites to visit your website, then you'll want to at least include the major ones such as Google Translate and others. You can find a list of the major ones or stick to Google if you like. - Yahoo & Bing Domains and Sub-Domains: Wherever your articles are being read, you'll need to include these sites as well. - Articles: If you are using articles from other websites that have your ad code and you have promised to share your AdSense revenue with the parties involved, then you will need to enter all of the article URL codes separately in order to make sure that they are authorized. We've noticed your ad code has appeared on websites you haven't authorized. 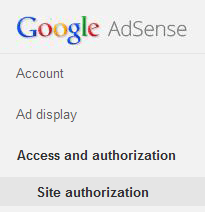 To avoid lost revenue, make sure to authorize any sites you own to display ads by visiting your account settings. However, if these sites are not authorized, then you can feel comfortable by ensuring that their domain is not on your list and Google will not punish you for the theft by others. Also, keep in mind that any domain name that is using your ad code and is not authorized will remain in place and not generate any money for you. So, you cannot profit by the theft of others even when they are using your ad code. While this may seem unfair in a sense, the way the process works does keep your website from being punished for what someone else has done. There are a number of things that you will need to be aware of when using this particular program. First, be sure that you check it frequently so that you can catch any warning early on. You only need to sign into your account and check the dashboard where the authorization is located. By checking frequently, you can catch those who are authorized and add them to your account. Remember that any partner websites of Adsense such as youtube.com, blogspot.com, blogger.com etc. are fully authorized to show your ads without having to add them to your account listing. All partner websites of AdSense qualify, so you only need to restrict yourself to the sites that are outside that particular area. When you add a domain to your list of sites that are authorized to use your ad code, they will automatically be added to your list of sites that you own as well. This means that you don't have to add them twice and can limit your efforts to just the first authorization part. You'll want to use this feature in order to avoid any misunderstanding and especially to avoid being punished for something that you did not do. However, you'll need to prepare a bit before entering all of the applicable domains that can use your ad code. By taking a little time and going over all the places where they appear, you can add them in and get the greatest benefit from this particular feature of AdSense. If you have any more questions, you might also try posting them here in the Adsense help forums.